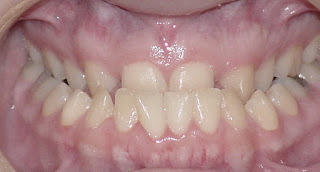 There have been many studies to demonstrate and quantify the benefits of correcting any number of malocclusion. We may correct crowded teeth to improve alignment and allow teeth to be cleaned better; we can close the teeth together better in some cases to improve a patient’s ability to chew food and we can close gaps that would otherwise trap food and lead to periodontal bone loss (gum disease) which eventually can lead to loss of teeth. We can correct poorly fitting teeth and even jaw positions for better function to prevent excessive wear/fracture of teeth and we can improve joint function and prevent future TMD or chronic joint pain (sometimes accompanied by chronic headaches). 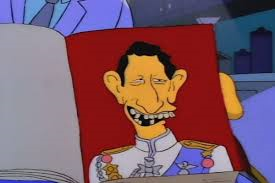 And of course we can provide a beautiful smile. What we normally do not stress is the psychological effects on children (and adults) when their smiles are transformed from something they normally hide to something they want to show off. 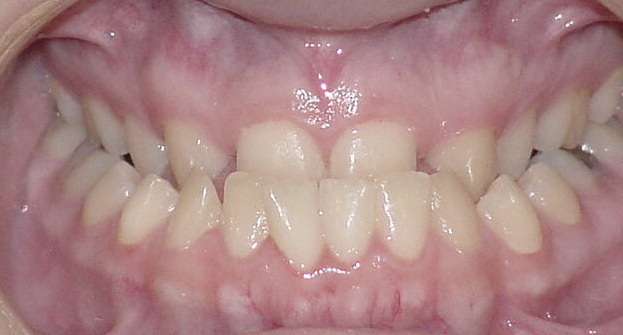 It’s not always “polite” to discuss behavior and self-esteem with the parents and patients due to unsightly teeth; after 20 years in dentistry I have learned that some parents (not all) do not appreciate you pushing your view of “beauty” onto their perfect children and I understand this view. And in most cases the function is so bad in these cases that we can focus on the more acceptable reasons to treat knowing secretly that we also get to provide a great smile that will change that patient’s life in many more ways. I don’t think anyone will miss the new look with a corrected nose. I am guessing this young lady is quite happy that her physician did send her to the appropriate specialist to have the correction performed (see side-by-side comparison below). 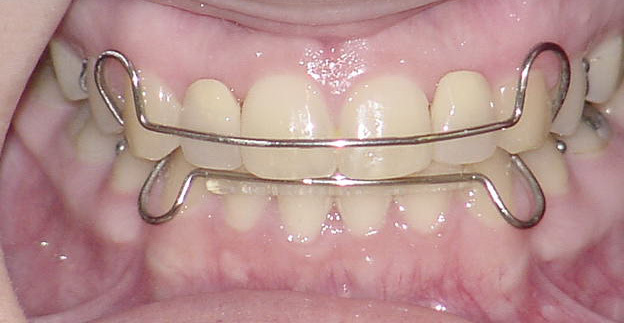 Once space was made available, artificial teeth were placed onto the wire with braces until treatment was completed. Once completed, artificial teeth were made into the retainer so that the patient would have a full smile until implants could be placed. Notice now following the correction how her entire face is smiling, revealing her new, improved and beautiful smile; look at her overall appearance with hair well-kept and made up. 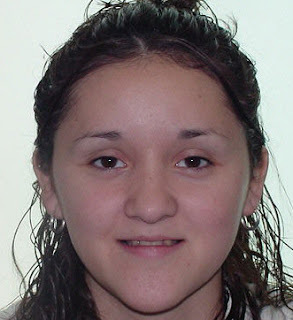 There was no scheduled picture for the patient to prepare herself, it is a genuine representation in her over-all appearance reflecting a new personality full of self-esteem and a contagious positive energy. As an Orthodontist for 15 years and a dentist for 20 years, I can tell you this is a very common and happy occurrence I have seen hundreds of times over and most Orthodontists will tell you that it is the greatest part of what we do for our patients. In fact, there have been considerable efforts to quantify these self-esteem and self-image changes in the literature using well established psychological testing during and after treatment. It should be no surprise to anyone that one’s appearance greatly affects self-esteem and confidence not only with one’s peers but also when looking for jobs (some scientific papers have even demonstrated that the appearance of one’s teeth reflects on judgements of intelligence which is of course nonsense). 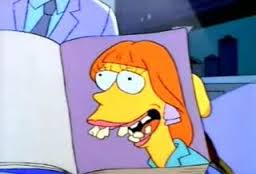 Even Hollywood has this tendency to cast characters of poor intelligence and/or ill manner with actors showing poor dental alignment (I immediately think of the Harry Potter series with multiple characters seen as dim due to their facial pattern or dental malocclusion. Read enough novels and you will even see dental malocclusions described in detail to describe unsavory stereotypical characteristics. In the art world this was also very common throughout the 18th and 19th century genere scenes with the handsome hero with broad smile and the dim witted bar figures or sinister characters with gnarly teeth and a bump on their nose. There was even an entire science (Physiognomy) devoted to correlating facial appearance to temperament and intelligence prior to modern science which led to (and reflected) many incorrect and hurtful stereotypes. We may not admit it, but we are a society that can’t help but judge ourselves on appearance and this translates to our children and their peers. For better or for worse, this is mirrored in films, literature and modern culture. Luckily today, it is a relatively easy fix so we accept it and we work to correct our smiles with braces (or aligners in more mild cases). The positive side effect is that we get healthier and longer-lasting smiles; heathier joints and significantly less damage/wear to our teeth. 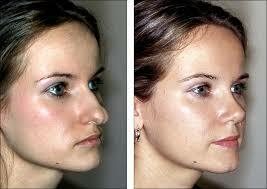 Perhaps in this case, vanity may be a good driving force to correct problems that otherwise may go untreated. 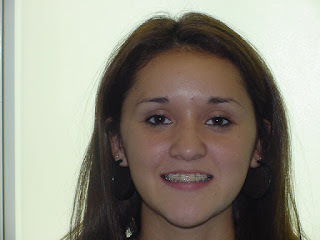 Regardless, setting the faults of our society and culture aside, braces can and do help self-esteem. Straight teeth are a sign of beauty and even though a smile won’t guarantee a successful future full of job-offers, long walks on the beach with a beautiful partner or happiness in general, the confidence a smile provides certainly can help! “The Proof is in the Plaster” Is your Orthodontist showing you previous cases? Is your Orthodontist showing you previous cases? There are many styles of consultation/new patient protocols Orthodontists use to discuss treatment with prospective patients. Some Orthodontists may simply look and tell you braces are needed; some dentists now just include Invisalign as part of their general dental care (along with cleanings, fillings and crowns) as if it is as simple and predictable as a single filling. Others take specific records to better evaluate the patient then give a treatment plan and cost. Still others take the records then schedule a separate consultation after the records have been more thoroughly reviewed. My feeling is that as the Orthodontist becomes more experienced, he or she can give a better judgement of the orthodontic needs in a single visit and save an appointment for both the patient/parent and him/herself (though I usually do not) if the patient prefers but they should never skip over a thorough explanation of the case with records if requested. So what is best? 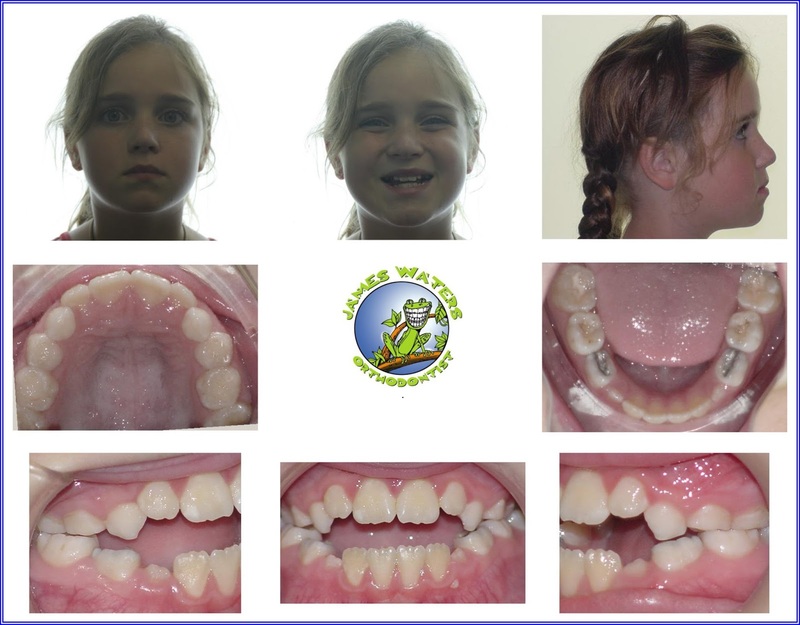 How important are the orthodontic records in planning treatment? 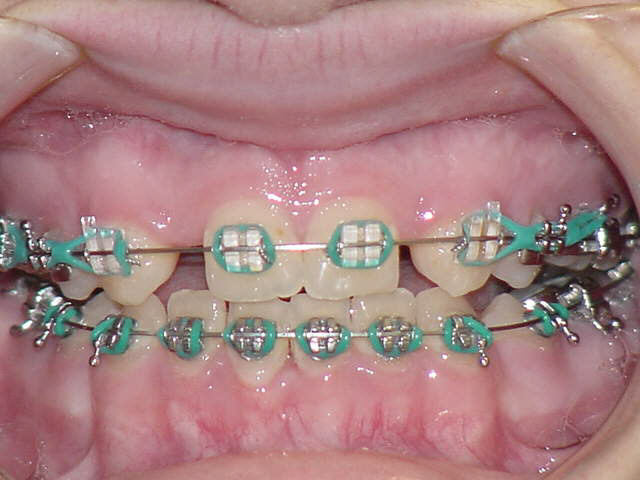 What questions should be asked to decide between two or more Orthodontists? Can your dentist just do the Braces or Invisalign? There is no simple answer since every case is unique. In the past, it was standard to fully evaluate a patient and their records (photos, radiographs and plaster models of their teeth) prior to recommending any specific treatment. But in the advent of the digital age, with more younger Orthodontists in the market place, and with increased competition between professionals (including between the un-trained general dentists and the specialist Orthodontists), we have seen a shift to the “grab them while you can” mentality to get the patient into the practice first then decide on treatment “as you go”. This doesn’t mean the orthodontics won’t be effective or successful but it may mean you (and/or your treating doctor) don’t know exactly what is going to happen during treatment and it can lead to misdiagnoses and prolonged treatments from insufficient planning and/or unrealistic expectations. I prefer to see the patient for a single complimentary exam just to determine if orthodontics is even necessary or if the patient is ready for any treatment. 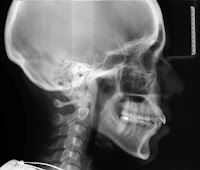 If there is any question, I will take a complimentary panoramic radiograph to screen the patient further. If treatment is warranted, I will give the patient/parents a quick summary of why I believe treatment would benefit the patient then I schedule full records (a separate 30 minute visit where another radiograph, photos of the face, intra-oral photos and plaster models are taken). Usually, I have time set aside to take records after an exam but patients are not pressured into the records. 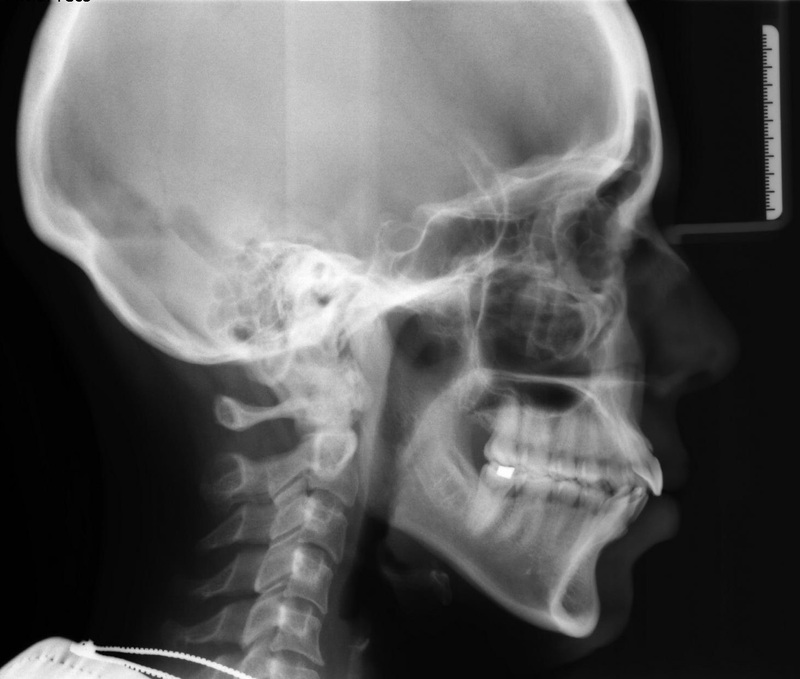 A typical set of records for planning treatment includes plaster study models, a cephalometric radiograph, a panoramic radiograph and full series of extra and intra-oral photographs. Offices may attempt to draw patients in with “no fee records” which always seems to mean either incomplete records or a higher treatment fee; I believe in a modest and separate fee for the records ($250 presently) to offset the time to take and prepare records, for materials and for the extended time it takes to review and plan treatment. Without a records fee, I believe the tendency is to over-charge mild cases and under-charge difficult cases and it opens the possibility of the doctor missing important but subtle issues that may be present. After the records appointment, I set the patient/parents up for a sit-down consultation where we review the records and the full treatment plan. Most importantly I go over similar cases I have already treated showing pictures and models of the “before and after” while explaining similarities with the current case. I give copies of the records to the patient following the consult along with a full copy of the treatment plan so if they want to shop around, they can compare oranges to oranges and I reference my website for reference if they have any questions about me or my treatments (www.bracesaustin.com) . 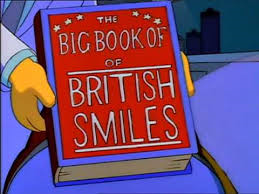 “The Big Book of British Smiles” to make the point for braces referencing the all-too well-known stereotypical Socialized British dental care. Unfortunately my specialty is not immune to salesmanship and business management; both are fine as long as the sale can be backed up with successful examples of previous and similar cases. Gone are the days that an Orthodontist hangs a shingle, opens an office and is instantly successful; competition and costs are far too great to ignore the business aspect of Orthodontics (or Dentistry itself for that matter; refer to previous Blogs on the Costs of Dentistry). So I cannot fault my brothers and sisters too much for if they are unsuccessful in practice, they won’t be able to help anyone but that does not mean you cannot find thoughtful and skilled Orthodontists for you and your family if you know what to expect. 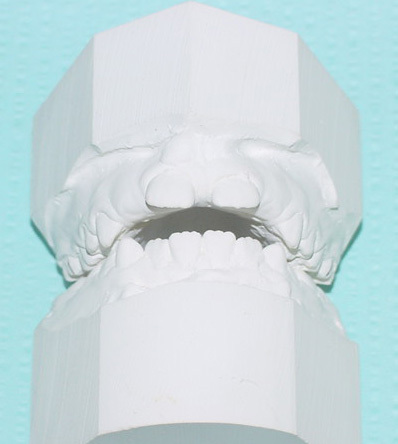 In the past we would say “put the plaster on the table” referring to the plaster models taken before and after orthodontic treatment. The fact is that the best way to assure your Orthodontist can provide you or your family with that perfect Hollywood smile is to see that he or she has done it for others with the same problems. And that doesn’t mean reviewing pictures from patients treated by someone else; before and after cases don’t mean much if the work was not performed by the Orthodontist you are considering! 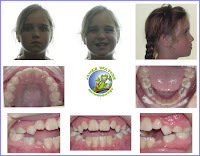 I make books of patients every few years as time permits so that I can quickly reference before and after cases for anything as simple as mild crowding and overbite to multiple missing teeth and even severe growth anomalies requiring surgeries. In some cases, I have case reports over 10 years to show growth, development, treatment and stability (or relapse and re-treatment if necessary). After 20 years in dentistry and 15 years as an Orthodontist, I have seen and treated most issues you could imagine (and many you could not). 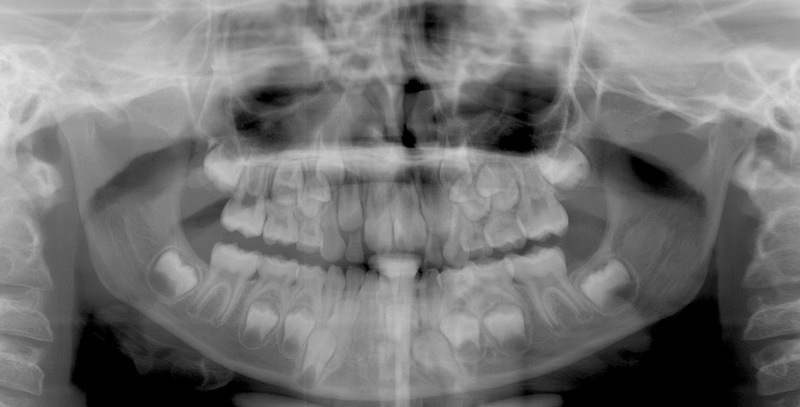 I am proud of my work and I always look forward to sharing cases; any good Board Certified Orthodontist would feel the same (you can see some of my cases I used for books at www.bracesaustin.com/smile-gallery). That is a question only you can answer; if the case is obviously simple, records have been taken and the Orthodontist is experienced with a good reputation (Board Certification is a big plus as well) then you are likely fine. However if the bite is significantly crowded, there is a shift in the jaw, there is joint pain, you are waiting on teeth to erupt, or there is no room for future teeth to erupt then you might consider a more thorough exam elsewhere before making a decision. So look for the evidence that your Orthodontist can treat you and/or your family, ask to see results of similar cases, ask about specialist training and ask friends and neighbors for their experiences; Check to see if they are Board Certified specialists and when you visit the office, watch how the staff behaves (are they proud of what they do; are they polite and well trained?). Above all, remember that the proof is in the plaster! Dr. James R. Waters is a 1996 graduate from UTHSC Dental School in San Antonio, 1997 graduate of Advanced Dentistry from the UNMC in Nebraska and the 2001 Valedictorian graduate from the prestigious Saint Louis University Orthodontic Program receiving the J.P. Marshall award for clinical excellence in 2001. He holds a Bachelor’s Degree in Science, Doctorate in Dental Surgery, a post-doctorate certificate in Advanced Dentistry, post-doctorate Degree in Orthodontics & Dentofacial Orthopedics and a Master of Science Degree in Orthodontics. Dr. Waters and his wife of 20 years live in Austin, TX with their 4 children where he has a thriving, multi-faceted Specialist practice with locations in Steiner Ranch and North-Central Austin. You can learn more about Dr. Waters at www.bracesaustin.com .